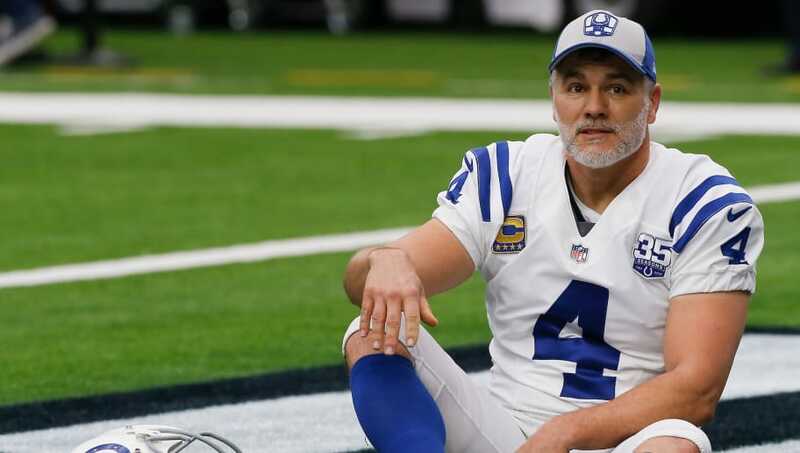 News broke today that legendary kicker Adam Vinatieri would be re-signing with the Indianapolis Colts for the upcoming 2019 season, in what will be his 24th season in the NFL and his 14th with Indy. With one more year in the NFL, Vinatieri has the opportunity to extend his lead atop the NFL's all-time scoring list. Let's take a look at the top 10, starting with the man himself. Vinatieri currently reigns supreme over the rest of the league in terms of all-time points, and by the end of next year, it may not even be feasible for any active player to reach the future Hall of Famer even in their wildest dreams. Vinatieri currently has 2,600 career points in his time with the Patriots and the Colts, and four Super Bowl titles to go along with them. Over his career, Vinatieri has been the benchmark for what kickers should hope to accomplish in the NFL. After countless game-winners, 582 total kicks made, and some unforgettable memorable moments to go along with it, it is obvious to say that Vinatieri is the greatest to ever do it at his position. Morten "The Great Dane" Andersen is second on the list, and was No. 1 upon his retirement in 2008. Andersen also leads the NFL in games played with 382 after playing a grueling 21 seasons in the league, primarily with the Falcons and the Saints. The Great Dane was inducted into the Hall of Fame in 2017 and is widely regarded as one of the league's greatest foreign-born players. Originally from Denmark, Andersen would find his future footballing career after a failed attempt at international soccer. He moved to the U.S. at age 17, and the rest is history. Gary Anderson is another one of the NFL's great foreign-born talents. A native of South Africa, Anderson also moved to the U.S. as a teenager, where he picked up kicking a football with ease after training as a soccer player with his dad for so many years. Anderson spent 23 seasons in the league, mainly with the Pittsburgh Steelers, with whom he spent 12 years. He was selected to four Pro Bowls during his tenure but never won that elusive championship ring. Jason Hanson, the 21-year Detroit Lion, comes in at fourth on the list. He was originally drafted by the Lions in the second round out of Washington State back in 1992, and only retired somewhat recently after his final season in the silver and blue in 2012. Hanson also holds the record for most seasons played with one NFL franchise. The last player from the '80s to ever play in the NFL come the 21st century also happens to be the fifth all-time leading scorer. John Carey was originally drafted by the Bengals way back in 1987, and bounced around many teams in the league, ending with over a 20-year pro career and a Super Bowl title that he won while with the Saints. Stover is most renowned for his career in Baltimore, where he spent 13 seasons with the Ravens. However, he spent a total of 19 years in the league, winning two Super Bowls in that time span as well. In 2009, Stover also ranked as the third most accurate kicker of all time--which has since changed. Blanda was a rare two-way player, getting it done on offense and special teams. Blanda played 26 seasons in the NFL as both a QB and a kicker and retired from the league in 1976 as both the oldest player of all-time at age 48, and as the all-time points leader. He was also one of only two players to play in four different decades. Elam was a 17-year NFL veteran, who primarily spent his playing career with the Denver Broncos, where he won two Super Bowl rings. He also held the tied record for longest field goal in NFL history with a 63-yard conversion, a mark that was later broken in 2013. John Kasay was a former fourth-round pick by the Seattle Seahawks in 1991 out of Georgia, and spent 20 years in the NFL, bouncing between the Seahawks, the Panthers, and the ​Saints. The only other active player in the top 10, Janikowski is a modern-day kicking legend. Originally a first-round pick by the Raiders in 2000, Seabass was in Oakland until 2018 before moving to Seattle last year. There's no question in his talent, but at this point in his career, physically it seems like the Polish-born Janikowski may not be able to hold up much longer. Regardless, this man is likely a future Hall of Famer.